One slot that is very popular in the Real Series from RTG is Aztec's Treasure. Considering how many RTG slots have been released and with such a large amount of different themes, it is not a shock that the Aztec theme is covered in one of their slots releases. This 5 reel, 20 payline video slot has stacked wilds and free spins, so it is not surprising why it is a favorite with players. 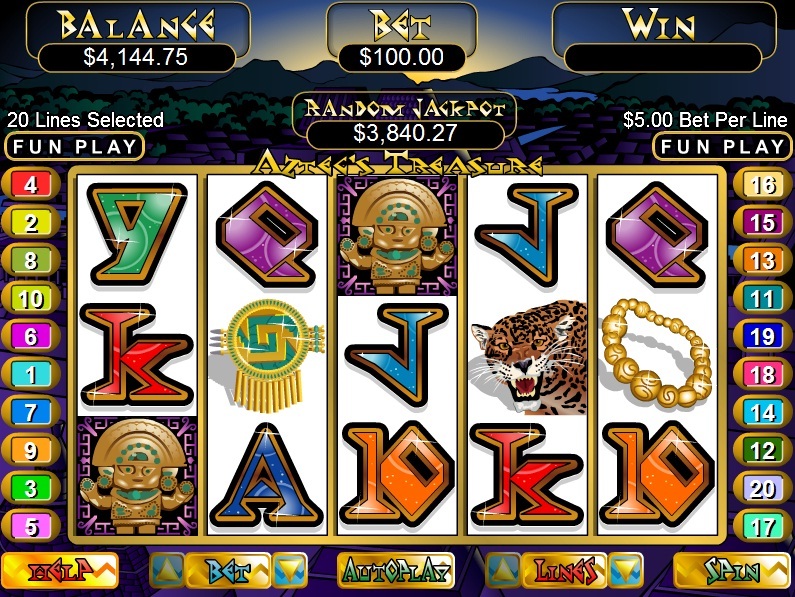 Let's face it, everybody loves an Aztec slot and Aztec's Treasure is no different. If you've ever played Play'n Go's Indian Jones-inspired Aztec Idols slot then you are on the right track with this RTG release. The symbols on the reels are all Aztec-related with several Aztec jewels and statues along with the standard 9-through-to-Ace symbols in Aztec font. You want the Aztec theme covered in every corner? You've got it! Aztec's Treasure has a free spins bonus round, which is triggered by getting 3 or more Scatters anywhere on the reels. This will reward you with between 5 and 15 free spins, with a 3x multiplier. If the Scatter symbol re-appears during the bonus round you get an extra free spin, which can happen multiple times per spin if you are lucky. With a 3x multiplier, you are really hoping to see those stacked Wilds on reels 2, 3 and 4. If you have played IGT's exciting Wolf Run slot, you will know exactly what I mean. 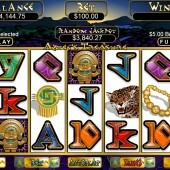 This slot, like all others in the Real Series, has a random jackpot ticker which can be won by any player at any stake. There is also a version of Aztec's Treasure called Aztec's Millions, which has a progressive jackpot ticker of over $1 million. I'm sure you will agree that a progressive jackpot that large is certainly not to be ignored.